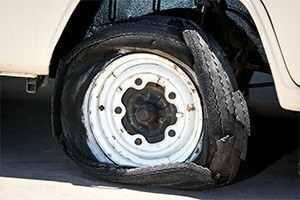 Tire blowouts are associated with many car crashes on a yearly basis. Often, these crashes are due to defective tires. Some of the manufacturers whose tires have been recalled due to defects have included Firestone, Michelin, and Bridgestone. If you were in an accident involving a faulty tire, the tire defect lawyers at Moll Law Group are available to help you seek compensation. Billions of dollars have been recovered in cases in which our auto defect lawyers have been involved. There are numerous types of tire defects. Generally, tires have an expiration date, and if a tire is too old and the rubber has degraded, it may be susceptible to more defects, resulting in an accident. In some cases, a tire is not appropriately manufactured or designed, resulting in tread separation. Treads can be separated due to poor bonding between the rubber and steel during manufacturing. Another potential defect is a weak sidewall that explodes while the vehicle is moving quickly. In such cases, a driver can lose control of his or her vehicle, and the vehicle may roll over, resulting in spinal cord damage and other catastrophic injuries. If the explosion occurs while the tire is being changed, a victim could suffer disfigurement of the face or limbs. If a tire is defective due to a flaw in design or manufacturing, you may bring a product liability lawsuit to seek compensation. You need to show that the defect existed at the time the tire left the manufacturer. There are several theories under which recovery may be possible: negligence, strict liability, or breach of warranty. Strict liability requires a plaintiff to prove that a manufacturing, design, or marketing defect existed and that the defect caused the plaintiff's injuries. It is often necessary for your tire defect lawyer to retain an expert to testify as to the existence of a defect. In some cases, the tire was not defective when it was sold by a manufacturer, but it was defective when it was sold or put on the vehicle. In that case, you may have a cause of action against the seller rather than the manufacturer. Manufacturers or sellers may argue that a driver's negligence, rather than a defect, caused an accident. In some states, particularly those where a product liability lawsuit must be brought on a theory of negligence rather than strict liability, if a driver's negligence contributes to an accident, the damages will be reduced by his or her proportion of fault. Damages that may be recovered in a defective tire case may be both economic and noneconomic. Economic damages often include medical bills, lost income, lost earnings capacity, property damage, and out-of-pocket costs. Noneconomic damages are less tangible damages, such as pain and suffering and loss of enjoyment. At Moll Law Group, our product liability lawyers are available to bring a claim on behalf of people who have been injured by defective tires. We represent accident victims nationwide, including in Florida, Texas, California, Illinois, New York, Ohio, Michigan, and Pennsylvania. Call us at 312-462-1700 or use our online form to set up a free consultation with a tire defect attorney.